We have recently been awarded the Merlo franchise and we are therefore keen to recruit Service Technicians with previous experience of repairing forklifts to support the range. its UK team with the appointment of three new technical product support engineers. Miles Metcalfe and Thomas Sloan (below) will be working directly with the dealer network to provide technical support across all Kuhn products as well as handling technical enquiries, modification programmes, warranty claims and customer training. Miles graduated from Harper Adams University in 2014 with a Masters in agricultural engineering. Thomas joins having spent two years in Australia working at the Claas Harvest Centre and on a 14,000ha cropping farm. Before this he worked for James Gordon Engineers in south-west Scotland as an agricultural technician before studying land-based engineering at SRUC Barony. A Harper Adams graduate in agricultural engineering, Edward Worts has held a similar role at Kuhn Saverne in France. In addition to a training role, he’ll be working alongside the aftersales team to provide product support. 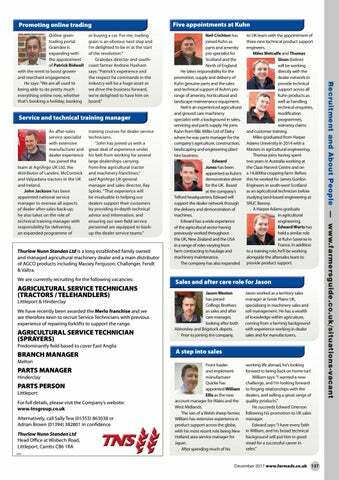 Jason worked as a territory sales manager at Great Plains UK, specialising in machinery sales and soil management. 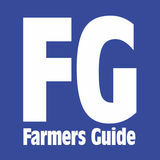 He has a wealth of knowledge within agriculture, coming from a farming background with experience working in dealer sales and for manufacturers.